It has almost the exact same texture as pulled pork or chicken. Have you noticed the oversized, green, sea urchin-like fruit in your supermarket’s produce section? It's called jackfruit, and it happens to be a dead ringer for meat. The buzzy vegan substitute is popping up in recipes for pulled "pork" sandwiches, tacos, chili, even sushi bowls. The tropical native has actually been used for centuries in Thailand, Indonesia, Sri Lanka, and India, where it stars in a wide variety of recipes—from breakfast staples to sweet desserts. Naturally mild with a meat-like texture, the exotic fruit absorbs the flavors of the foods and spices it's cooked with, which makes it a great option for tasty vegan and vegetarian dishes. And as health-conscious consumers crave more plant-based meals and snacks, demand for the prickly fruit is spiking. What’ more, jackfruit is considered a sustainable food, because the jackfruit tree is drought- and pest-resistant; and a single tree can produce up to 200 fruits per year, some as large as 100(!) pounds. 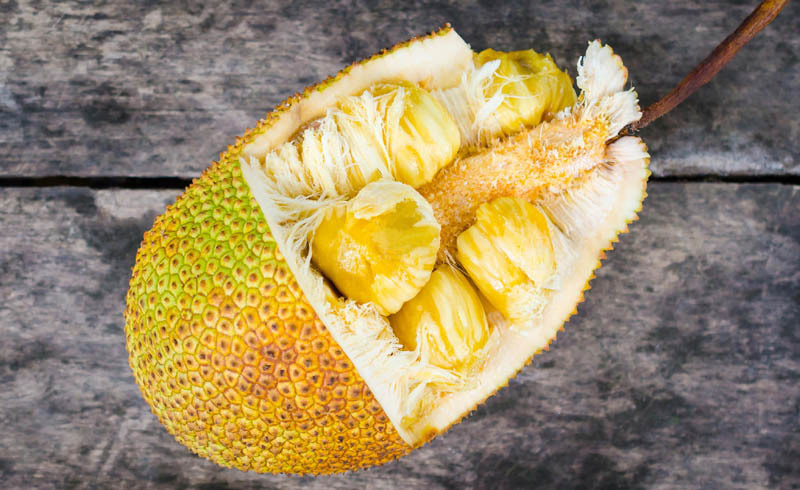 Jackfruit is now harvested in Florida, and grocery stores around the country carry it. Amazon sells fresh jackfruit too, as well a wide variety of canned options and packaged jackfruit heat-and-eat products. Like all fruits, jackfruit supplies plenty of nutritional perks: It’s low in calories, naturally fat- and sodium-free, provides ample vitamin A (in the form of beta-carotene) and vitamin C, and packs in a surprising blood pressure-lowering potassium. It's also rich in fiber, which means it can help you feel satisfied on fewer calories. Many of the heat-and-eat jackfruit products provide about 6 grams fiber and 100-120 calories per serving. While jackfruit is often marketed as a meat substitute, it’s nutritionally more similar to a starchy vegetable than lean protein. A typical serving of a jackfruit product will have 2 grams of protein, compared to 6-7 grams of protein in an ounce of meat, poultry or fish. So for a balanced meal, make sure you pair your jackfruit with a side of beans, or other protein. What you make with jackfruit depends on whether its ripeness. Unripe jackfruit (with bright green skin) can be enjoyed as a meat substitute in barbecue, Tex-Mex recipes, jackfruit pot pie, curries, whole grain bowls, and much more. 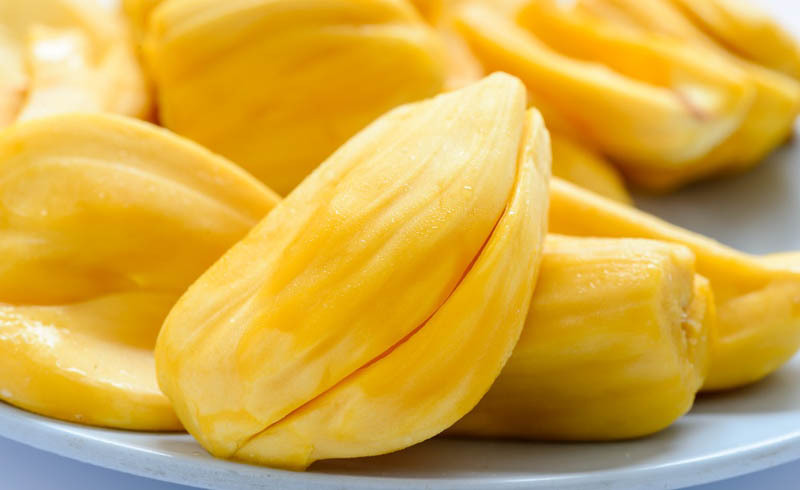 If you have ripe fruit (with brown skin), it will taste sweeter and can be used uncooked in smoothies, baked goods, or in other ways in which you’d eat a tropical fruit. Not up for peeling and preparing fresh jackfruit from scratch? You can find many seasoned and pre-cooked options, like those from The Jackfruit Company and Upton’s Naturals (no relationship to me). So if you're in the market for a nutritious, sustainable vegan substitute, it's worth giving jackfruit a try. It just might make you forget meat altogether.